Jump to timeline Some deadly mass-shootings in the U.S.
Video: What led to the Conn. workplace rampage? Transcript of: What led to the Conn. workplace rampage? MEREDITH VIEIRA, co-host: This morning, shocking new details are emerging about what caused a Connecticut man to go on a shooting rampage at work killing eight co-workers before turning the gun on himself. NBC 's Peter Alexander is in Manchester , Connecticut , with the latest. Peter , good morning. PETER ALEXANDER reporting: Meredith , good morning to you. This is an awful one, the staggering death toll this morning stands at nine including the shooter with one person still hospitalized. And this morning we're learning new details about the final moments before that shooting where company officials say they called Omar Thornton into an office and showed him a video that they say showed him stealing from a company truck. Then, just moments later, he opened fire for what was the worst workplace mass murder in this state's history. This small Connecticut community is in mourning, still stunned by its devastating loss. Ms. SUSAN HOLLANDER (Wife of Hartford Distributors Executive): It's just shocking. It's still shocking. It's just -- it's unbelievable. ALEXANDER: The shooting began shortly after 7:00 Tuesday morning here at Hartford Distributors , a family-owned beer and wine wholesaler. The company 's CEO tells NBC News 34-year-old Oman Thornton was called into a room for disciplinary hearing with managers and calmly watched video that even union officials say showed him stealing from a company truck. Chief MARK MONTMINY (Manchester, Connecticut Police Department): At the conclusion of that interview, we're told he was given an option to either resign or be terminated. ALEXANDER: The CEO says Thornton signed a resignation paper and was then escorted from the room, asking for a drink of water before police say he pulled out a hand gun and calmly opened fire. As cold as ice, said one victim. Mr. JOHN HOLLIS (Teamsters Spokesman): It couldn't have happened at a worst time of day because you got the third shift going off, the first shift coming on, the office staff there, the sales staff there. ALEXANDER: Thornton , hired just two years ago, saved the last shot for himself. Mr. HENRY HOLLIDAY (Shooter's Uncle): There's no winners here. You got nine families that are grieving. ALEXANDER: Joanne Hannah claims her daughter dated Thornton for eight years and says he called his mother during Tuesday's rampage. ALEXANDER: Hannah says Thornton told her daughter he'd complained to his supervisors about being racially harassed at work. The company 's CEO adamantly denied those allegations and the union says there's no record of any complaints from Thornton . Ms. HANNAH: My daughter's just as shocked as everybody right now. She did not see anything like this. She knew he had a breaking point. He was getting sick of it. Ms. KATHY GEORGE (Employee): Well, I'm trying not to cry. It's just shocking, especially Omar . I mean, he just wouldn't -- I didn't know there was a problem. ALEXANDER: Among the victims, Victor James , a grandfather of four who would have turned 60 this month and was planning to retire after 30 years as a driver. Mr. JOE WILLIAMS (Friend of Victim): It was a loss of a dear friend of 40 years and I was shocked, anger. A good family man, a good friend, a good husband and a good father. ALEXANDER: And overnight we heard from another driver at the company who told NBC News "We are not racist. We are a bunch of hard-working guys that work for a good company ." Meredith , he said, "none of us deserved this." 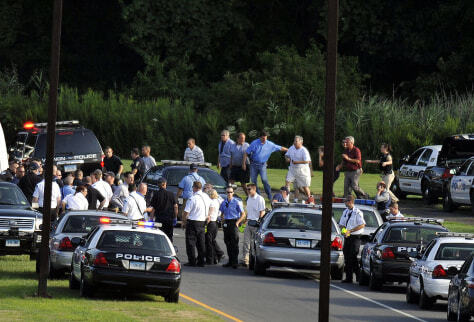 People are seen being evacuated from Hartford Distributors, Inc., in Manchester, Conn., Tuesday.